Description: AMTK 56 & 46 lead an eastbound train through Wauseon, OH. Description: Amtrak 56 passes a eastbound double stack has it heads towards Pittsburgh. Description: Amtrak 8 rolls through Homer West just 5 hours late. Second from the rear is a the privatre car Montana. Description: #49 westbound at AUTO-179. These signals have since been replaced. Description: #49 westbound at Schenectady. Description: This engine was added to Amtrak 22 at the Fort Worth Intermodal Transportation Center. This engine was involved with a crossing accident when it hit a truck. Notice the change in motors on the trucks; very shiny compared to weathered look on the other ones in the set of two. Description: Amtrak Downeaster 694 rolls through Mountain Junction as it departs Portland for Boston. Description: The Amtrak Downeaster comes off the old Maine Central Mountain Division line as it departs Portland. Description: Amtrak train #5, the California Zephyr, cruises through the Illinois countryside on a very warm July afternoon along the Mendota Sub. 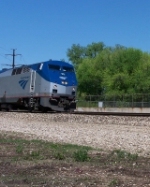 Description: Amtrak westbound on the BNSF Mendota Sub. Description: slides past the site of the old A wye Tower and cotinues back north to greendale station to sit until mornig before heading back north. Description: AMtrak P42DC 56 heads into Chicago UNion Station - Roosevelt Avenue. Title: Amtrak 48 "Lake Shore Limited"
Description: Amtrak 48 "Lake Shore Limited" arriving at the William F. Walsh Regional Transportation Center in Syracuse, NY.